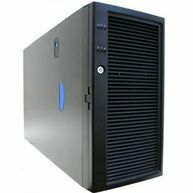 ItInStock.com supplies the high quality new, refurbished and used Tower Servers at highly competitive prices. We stock all the leading manufacturers across Tower Servers: Dell PowerEdge Tower Servers, Fujitsu Primergy Tower Servers, HP ProLiant Tower Servers, IBM Tower Servers, Supermicro Tower Servers, Sun Oracle Tower Servers and Other Tower Servers. A Tower Server is a computer intended for use as a server and built in an upright cabinet that stands alone. The cabinet, called a tower, is similar in size and shape to the cabinet of tower-style personal computer. This is in contrast to rack server s or blade server s, which are designed to be rack-mounted . ItInStock.com can also supply Rack Mount Server with a different specification to suit your requirements; more or less memory, different or additional hard drives etc. Please CONTACT US for a quote.